Commercial Net makers has earned a reputation for providing Australia with high quality, incredibly durable custom made nets. Our highly skilled and experienced team of netmakers understand the importance of creating custom netting that is tailored to your application. As Australia’s preeminent net suppliers, we work hard to understand your needs and produce products of the highest standard. Anything from fruit fly netting to shade cloth, safety cargo nets and more, our professional net manufacturers can provide you with a cover that will continue to fulfil its purpose over time, mitigating damage from mother nature and other forces. Pest control nets, ideal for excluding birds and insects and protecting wildlife and personnel. Environmental netting for evaporation ponds, turkey nests, storage and waste facilities, containment netting, mining bird netting and more. At Commercial Netmakers, the customer really does come first. Our experienced team is dedicated to meeting the needs of our customers and that is our advantage. Whether we are designing innovative structures for difficult sites or working around the clock to meet project deadlines, we are 100% committed to excellent service. Commercial Netmakers regards each project as an opportunity for company growth and improvement, with consistently high expectations of our own service. Permanent net canopies are a major investment and the right net will deliver significant rewards over the lifespan of the structure. With a major investment like netting, it is critical to get it right the first time. Choosing one of the most trusted names in the industry will get you there. If you are looking for pre-made or custom designed netting solutions in Perth, Commercial Netmakers is here to help. 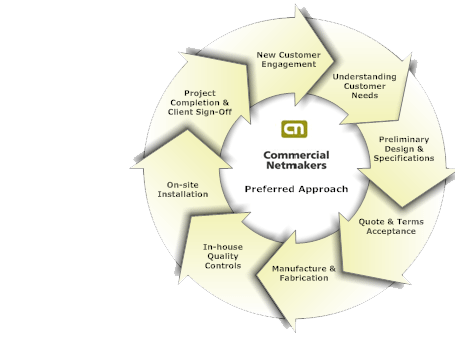 Talk to Commercial Netmakers about how we can help with your next project. With over 30 years of experience Commercial Netmakers are the premier netting company in Perth. Our specialised team excel in customer service to provide you with the perfect netting solution whether that be custom made or off the shelf. If you would like to find out more about our range of custom nettings, or would like to enquire about having your own custom net produced by our manufacturers, please feel free to get in contact with our friendly team of staff.